The Philadelphia Inquirer had an article last Friday about a tour of GTA transit systems by transit officials and planners from their city. One of the Toronto priorities that the Philadelphia-area visitors envied was the determination to build higher-density or “intensified” housing and commercial developments around transit hubs to reduce dependence on cars. One thing “that really impacted me was the sheer size of development within a quarter to half a mile of the Toronto subway stations,” said Andrew Levecchia, senior planner for the Camden County Improvement Authority. “Thirty thousand to 40,000 people at a transit node. This is what we need. . . . They seem to be more willing to intensify density” than suburban Philadelphia residents, he said. Shawn McCaney of the William Penn Foundation said the trip was valuable for providing members of the group something to compare SEPTA to. This is a vital message both for the well-established TTC and the would-be transit megasystem, Metrolinx. The TTC is part of Toronto’s success and thrives because Toronto, structurally, is such a different city in its population base. However, the dense, thriving downtown and some of the newer development nodes in suburbia mask fields of low-density development that will always be very hard to serve with transit. Transit folks in Toronto love hosting visitors because they are so impressed with what we have, but many of their problems with sprawl and the difficulty of attracting riders are our problems too. A few people have left comments here asking when I am going to write about the Federal and Provincial budget announcements. From my silence, you may have assumed a big yawn, or simply too little time, or the sense that there are better things to do. Actually, it’s a bit of all three. The TTC (and transit in southern Ontario in general) has a big problem thanks to the way governments make their announcments and finance large capital projects. It can be a real shell game trying to figure out how much money from any announcement is really there. Rather than establishing a standing fund for transit capital projects from, say, a percentage of sales tax, governments use trust funds and other similar devices as holding tanks for money burning a hole in their pocket. Suppose you want a subway. Well, we set up a trust fund and let everyone contribute to it and, eventually, we can actually build it. Never mind whether this is really the best use of the money, it’s been earmarked and that’s what it’s for. More subtle, however, is the accounting. Suppose you’re Ottawa and you have some spare change left over at the end of the year. Rather than paying down the deficit or lowering taxes (which would affect your revenue in future years), you stash the money in trust for a future project. This allows you to show it as an expense in the current year and have a nice press conference, even though you won’t actually have to spend it for as much as a decade depending on the project. In some cases, the money really is sequestered and earns interest that will contribute to the project, but there’s no guarantee. Because funds are announced and allocated for projects, we have a few TTC budget lines that are flush with cash, but many that go begging. To further confuse things, these are divided into “above the line” and “below the line” items. “Above” means that the project has Council approval, although it may not yet be fully funded. “Below” means that Council has not yet blessed the project, although other governments may be waiting in the wings with contributions. That’s how pet projects get built, and there’s all sorts of jockeying to ensure that favoured schemes find their way “above the line”. For those with the stomach to actually read through the TTC’s Capital Budget (two very thick blue binders containing more details about the TTC than even the most hardened transit fan will ever want to see), it’s important to keep in mind both the project status and the source of funding, if any. “State of Good Repair” projects almost always go “above the line” as they have first call on any available funds. Toronto has sad history with deferred capital maintenance (projects large enough that they are funded from the capital rather than the operating budget) and even now we are still making up for this in many areas. Funding comes from a dizzying collection of programs as each government seeks to rebrand its transit spending with yet another scheme. These are often time-limited, or overlap in various ways with existing programs, and it can be difficult to figure out where the next dollar will come from. In the agenda for the March 26 TTC meeting, a report talks about the funding problems, but the detailed information from the appendices is missing. 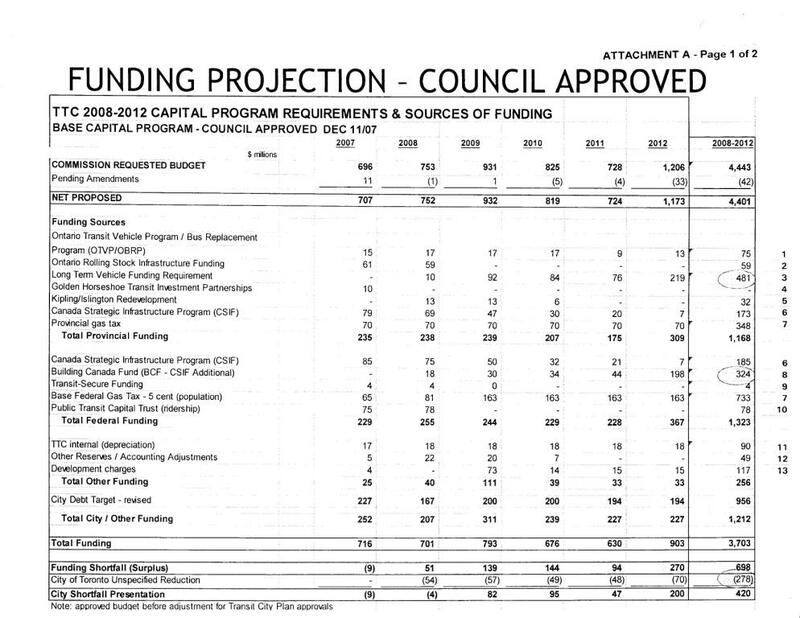 Appendix A gives a breakdown of the various programs that fund (or are hoped to fund) the capital program from 2008 to 2012. The numbers down the right hand margin refer to explanatory notes in Appendix B. I am not going to detail these here, but if you make it all the way to the fifth page, you will begin to understand why we have so many problems with planning capital spending for transit. It gets worse. Look closely at Appendix A and you will note three circled figures in the 2008-2012 column. Line 3 is $481-million of Provincial money that, when the report was written, had not been confirmed. Line 8 is $324-million of Federal money that’s in the same boat. Down at the bottom, is a $278-million “unspecified reduction” that the City made in the budget plans on the assumption that the TTC usually underspends on its capital projects due to generous contingency provisions, or because projects are cancelled or rescheduled beyond the five-year budget window. The funding shortfall starts out at $420-million, but when these three amounts are added back in, it rises to $1.503-billion. Provincial announcements made after the report was completed reduce this by $360-million to $1.143-billion, and the recently concluded agreement with Ottawa has released more funding as well. However, this still leaves a great deal to be found, and does not even touch the many “below the line” projects notably the new streetcar purchase and the SRT renovation. Funding must be in place by fall 2008 for the streetcar order to be executed with a supplier, and the SRT project requires funding by September 2009 to be started on schedule. If you thought all of that was complicated, there’s more. Late last week, there was much confusion over how much, exactly, Queen’s Park had announced to fund capacity expansion on the Yonge-University subway. The relevant section of the Budget has a table of “Metrolinx Transit Projects” (table 1 on page “34” which is really quite near the top of the linked document), and further information about GO Transit funding on page “35”. GO is still separate from Metrolinx and its funding is not yet bundled. The Yonge Subway Capacity Improvements total $293-million, and this is intended for the Automatic Train Control system. However, this project extends beyond the TTC’s five-year budget window, and only $189-million will be spent in that period. That’s why the TTC shows the smaller amount in its updated figures. The total cost of the ATC system is estimated at $342-million of which about $4-million had been spend by the end of 2007. This is the sort of confusion that arises when governments announce project-based funding, but transit agencies must restate this into current and future budget years to show where top-up municipal contributions might be needed, or where there will be pressure to defer or reduce some projects. If you are still here at the end of all of this, congratulations! This hopelessly convoluted way of planning and budgeting for transit clearly shows it is not a priority, not an important, entrenched program, but a series of ad hoc political announcements designed to give the impression of movement on a serious problem for the GTAH. The underlying question is whether municipal, or at least regional, agencies will be trusted with spending transit funds, regardless of where they come from, or if their every move must be balanced and monitored from two senior governments. Updated March 30, 2008: The attached spreadsheet has been updated to include information on the projected changes in vehicle loads and the list of outstanding changes that are awaiting sufficient resources to be implemented. I see the service summary is out early like usual this time (as opposed to the top secrecy back before the February improvements) and it shows most of the main service changes. (Searching the PDF for “Mar-08″ and “Apr-08″ highlights all the adjustments.) I have compiled them below (I have no life!! ), except for cases where there is no noticeable change and it may relate to minor trip adjustments. One service change that doesn’t show up as a change in the schedule is the decoupling of the Evans bus from the Prince Edward bus on weekends, which means that the Evans bus will end up with a 15-minute layover (plus 45 minutes round trip traveling) to maintain a 30-minute headway. Special arrangements for St. Clair are required because track from Bathurst Station Loop north to St. Clair will be replaced, and a captive set of cars will remain on St. Clair for the duration. These will run a three-minute headway between the two subway stations until mid-evening when the full route will switch over to bus operation. The TTC has not posted a service advisory for this project on their site yet, but I suspect that this arrangement will carry through until June given the speed of track construction jobs of this size. Even then, until the reconstruction from Vaughan to Dufferin is completed, streetcars will be limited to serving the east end of the line. One notable problem that the TTC has not addressed is overcrowding in the AM peak period on 509 Harbourfront. With the construction diversions, this seems to have fallen off of the radar, but there was a deputation at the TTC last year from people complaining that cars were full eastbound before they reached Bathurst Street. The new service is actually slightly worse than what was there a year ago in the AM peak, although some off-peak headways have been shortened. As we know both from riding experience on the 509 and the analysis of CIS data for this line I published earlier this year, the schedule for service on Harbourfront is often more creative writing than reliable fact. In an analysis of the 511 Bathurst route now in preparation will confirm, layovers at Exhibition Loop are quite generous and eastbound service on Fleet is quite erratic. The TTC really needs to start treating the new residential neighbourhoods on Queen’s Quay and Fleet to good, reliable service, not as a seasonal tag end of a route serving an amusement park. Today’s TTC meeting contained a few gems that will never show up in the press who have other, weightier matters on their minds (and limited space). I know she probably meant it to sound better than it does, but it’s amusing for a politician to think this is worth doing occasionally. Maybe about as often as all the Queen service gets to Neville Loop? Robert Wightman sent in the following comment about problems maintaining service on, mainly, the streetcar system on Tuesday, March 25. I spent yesterday afternoon rush hour working at home and listening to the scanner for TTC surface operations and this is what I heard. Russell could not send out all scheduled service because they did not have enough equipment available. A car on Carlton and one on Queen went disabled and had to be pushed to Russell. This took 4 cars out of service and screwed up the lines for awhile. The line inspectors must know that a Commissioner lives in the Beach because they turned two WB cars at Russell and sent them back to Neville. A fight broke out on a WB Queen car in front of the City Hall so the WB service went along Richmond to York thus bypassing the delay and the subway. A Spadina car went disabled in the Station and had to be pushed out. They decided to push it out to the street before locking out the brakes, bad move as it lost air on the curve and they had to crank the brakes off. They could not use the spare track as there was a car using it to “dry out”. It was waiting for the emergency truck as it had no fans and the windows were too steamed up to see out. This screwed up Spadina for a while. Another car broke a bar under the front truck and had to be escorted back to Russell by the emergency truck. Again there was no vehicle available to replace it. The emergency trucks were running all over the system making minor repairs to cars that were still in service but had no heat, one wiper missing, doors that wouldn’t open, lights that didn’t work. The subway had a train with a pair of cars that went disabled so they drove it onto the tail track at Finch until they could fix it. The system is broke and it isn’t getting fixed. The Inspectors managed to find enough cars that were to run in to replace the missing cars after the rush hour. How much of the service problems are caused by equipment failures each day? Yesterday was not good weather but this still seemd like a lot of problems for one rush hour. Both equipment and operator shortages remain a big problem especially for the streetcar system. We need some honest answers from the TTC about just how many cars are really available for service and why so many are sitting in the shop. I don’t think the situation has been presented with as much urgency as it deserves, and we still face the impact of having the St. Clair line fully back in operation sometime this fall or winter. New cars won’t be here for years, assuming we somehow find a way to find them this fall when it’s time to place the order. With the population of the Greater Toronto and Hamilton Area growing quickly, transportation issues in the region are moving to the forefront of public conversation. The Transit Camp community, with the sponsorship and active participation of Metrolinx (Greater Toronto Transportation Authority), is pleased to announce Metronauts, a project that aims to engage citizens to imagine the future and offer solutions for the region’s transportation plan. The new initiative is made up of two parts: an online community and a series of community events held across the Greater Toronto and Hamilton region between April and September 2008. Transit Camp began as a grass-roots event in Toronto in 2007, created without official support or sponsorship, and has since spread to other cities. The initial event was so successful that Metrolinx decided to sponsor this series of events and online activities by the Transit Camp community. The first of such Metronauts Transit Camp events will take place on April 5, 2008, at the MaRS Centre in Toronto. The event will be organized as an unconference, where every participant will have the opportunity to suggest topics for discussion and share their knowledge and experiences with the group. The event aims to attract transit riders, as well as drivers, pedestrians, cyclists, and anyone else concerned with how they get around the city. Mark Kuznicki, steward of the Toronto Transit Camp community, stresses that, “this is not a complaints department, it is a solutions playground.” The event is not about airing grievances; it’s about working together to make things better. Registration for the event will begin on March 25, 2008, at the newly-launched Metronauts.ca website. The website will provide event participants and interested citizens another avenue for discussion about transportation in the region, and will also facilitate individual and group projects for those looking to get involved directly. Information on future events and initiatives will be listed on the Metronauts website as it becomes available. Metronauts is a joint initiative between Metrolinx and the Transit Camp community. The project will include the online community site and a series of community events held across the Greater Toronto and Hamilton region between April and September 2008. The broader scope of Metrolinx’ planned consultation process is found in a report for the March 28 board meeting. As everyone knows, the public sector wastes huge amounts of money on overblown, out-of-control projects, or at least that’s the prevailing view in some quarters. One major side-effect of Ottawa’s participation in funding the York subway extension (or TYSSE: Toronto-York Spadina Subway Extension), in an insistence on value-for-money and the maximum participation by the private sector. Leaving aside that the TTC doesn’t actually build anything itself, and contracts out a vast amount of the design/engineering work, there is a perception that (a) subway construction projects could be better run and (b) there is (even more) opportunity for private sector participation. A report on this week’s TTC agenda discusses the various options for delivering this project and includes some revealing information about the pros and cons of various approaches. I will leave it to those who are interested to read the full text, but a few things caught my eye. First off, there are many ways and degrees in which a private sector company or consortium can be involved in large projects like this all the way from complete design, finance, construction and operation down to a basic contractor who bids on a job, builds a box and leaves. In the review of options, the variants where operation rested with a private entity were rejected outright because the TYSSE is part of an existing, operating, public-sector subway line. Experience elsewhere suggests that private operation tends to occur only when a new, free-standing line is built such as the Canada line in Vancouver. Financing options are not discussed at length, but this issue always turns on the question of whether a private partner can provide capital at a lower cost than a public agency. This also involves some creative accounting. A privately owned line (and its associated capital debt) does not appear on the public books. This scheme is commonly used to hide debts (think Enron), although generally accepted accounting practices for governments make this more difficult to pull off. Even if a government is not technically exposed to the debt, the last thing any (well almost any) provincial government will do is to let a subway line close because its owner is bankrupt. We have heard a lot lately about borrowing from large investment pools such as pension funds. Whether this is done on a government basis or by an arm’s length agency, somehow the interest and debt must be paid. Either this is a direct charge against current operations, or it is transferred to a government through a subsidy arrangement (no doubt with an appropriate management fee). As for construction, the difference between the two main options depends on whether the TTC designs it all and contractors just build it, or if the TTC says “build me a subway station” and the contractors design to a general set of specs and deliver a finished product. A working group from the construction industry reported that their preference is to leave the design to the TTC for contracts under $100-million, or where there will be multiple contractors (possibly including the TTC itself) onsite. This relieves the contractor of having to manage (and assume risk of) portions of the work not under his control. For large contracts, it may be worth a contractor’s while to bring the design work in house provided that the job is fairly generic and does not require skills in special systems peculiar to transit. For example, building an empty box that will become a subway station or tunnel structure is a fairly straightforward task while design and co-ordination of the many subsystems fitted within the structure are complex and outside of their regular scope of work. One point not mentioned here is that the industry’s skill base depends strongly on what they do most of the time. An important observation about Madrid in recent studies is that their continuous program of system expansion allows the industry to develop expertise and continuity of staff that would not otherwise be possible. In Toronto, there are only so many subways to go around among the major players, and we don’t build them very often. Finally, there is a breakdown of the TYSSE’s estimated cost — $2.09-billion in 2006 dollars, or $2.633-billion assuming completion by 2015. This date could slip if various governments spend time squabbling about whether the project passes a private sector sniff test, adding to the cost. For all you readers who have wanted a subway station of your very own, we see station costs of $73-to-$100-million depending on the complexity. Of particular note is a 26% contingency. This rather generous $400-million slush fund (a cool half-billion with inflation) will allow considerable overruns while keeping the project “on budget”. At this point, I will be generous and hope that this is for “things we haven’t thought of in the preliminary design”, but at some point this needs to be nailed down. I doubt we will ever know how much contingency everyone builds into their estimates (public or private partner) and yet there is probably more money on the table in this one line than in any savings, real or imaginary, from increased private sector participation. I should mention the rolling stock. The estimate shows 56 cars, although it is physically impossible to buy them in this quantity as they now come in married sets of 6. Even with these cars, the TTC will not have enough “Toronto Rockets” to completely replace the existing fleet on the Yonge-University-Spadina line, and another car order will be needed. Thunder Bay will be churning out cars for years. The TYSSE will be interesting if, for nothing else, showing us whether there is money to be saved on subway projects with greater private sector know-how at work. Alas, we won’t have an answer to the question for about 7 years, and we will have spent $2.5-billion finding out. The Environmental Assessment for the proposed Kingston Road LRT will hold three open houses on March 26, 27 and April 2. The project’s March 2008 Newsletter includes the meeting locations, a map of various proposals and a breakdown of travel in the corridor. There are two primary options depending on whether the line stays on Kingston Road all the way west to the existing streetcar network at Bingham Loop (Victoria Park & Kingston Rd. ), or if it travels west along Danforth Avenue. Sub-options include connections to the subway at Victoria Park or Main Station. The Danforth alignment is more straightforward, and also provides a better connection to the rapid transit network. In the origin-destination survey, only about 1/4 of the respondents showed their AM peak trip as going “downtown”. Planning for the revised Victoria Park Station (warning – 10MB file) does not show a possible streetcar service, but could accommodate it. Finally, the Walk 21 conference last fall included a paper about redesigning Kingston Road into a strong shopping and pedestrian community in the Cliffside area. This neighbourhood is now dominated by strip commercial and parking lots, but its transformation is supported by the business community with the new LRT line as a catalyst. This project is in an odd state of existing in theory, but never appearing on maps showing our bold new Transit City network. This very strange situation makes many wonder whether there is any hope of the project actually being funded and built.